Long ago, when a breeze from the ocean was expected, one of the local radio stations would forecast that the weather was turning due to the “cool marine influence.” One of the DJs at that time would always say, “The cool marines are coming!” I know I’m easily pleased, but I always got a kick out of that. Last night the cool marines landed. Finally. But sooner than the current crop of weather forecasters expected. And ohmygod was I glad to feel that cool ocean breeze! I threw open all of the window. And the cats, who had been pressing themselves against the tile floor, pressed themselves against the window screens. Which sort of blocked the breeze from three of the windows, but I can’t say that I blamed them. 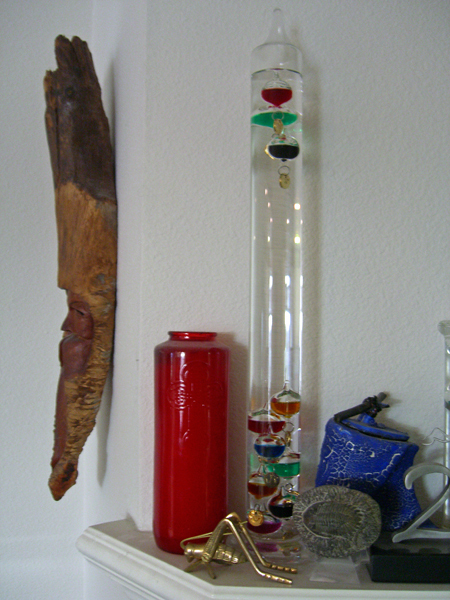 I have a Galileo thermometer on my hearth. (yes, yes… I have a messy hearth. It looks worse than it actually is because I have two mantel clocks right now.) The Galileo measures temperatures from 66 F to 84 F. This is the first time in five days that it has registered at all. It’s showing that as of 8:00 AM this morning, my house has cooled down to 80 F. It doesn’t seem like much, but that is a significant improvement. Yesterday the mercury thermometer on the furnace was through the top at 90 F. So who knows how hot it actually got in here. On Sunday I periodically grabbed the cats and splashed some water on them to help cool them down. Poor babies. It was so hot that they didn’t even care. I have managed to do a little bit of knitting on the Mudstone socks. But not enough to post a picture and brag about. Since it’s cooled down and the yarn won’t stick to me so much I’m hoping to get more knitting time in. All political parties die at last of swallowing their own lies. Linda: Thank you so much, Judy! Click on these buttons once every day to donate for free.